You guys mind if I join in either Thursday night or Friday am? Is there going to be an "FJ Camp?" i am going to leave 1:00- 2:00pm Friday afternoon camp Friday night south of the Expo. maybe on Schnebly Hill Rd or on the east side off of Stoneman Lake Rd . then go to Expo Saturday and camp some place again Saturday night and may go do Broken Arrow or Greasy Spoon on Sunday on the way home. is there a way to get to Woody Mountain off 17 or do you need to go to flag to pick it up and come back south. may try and meet up with you guys. cant leave until afternoon girlfrend is working until noon. i am the silver FJ with the RTT you see sometimes on 17 around Dove Valley. There's plenty to do on Thursday Mark. Looking forward to seeing you though. The only other way is possibly from Sedona but you’ll be on dirt for a WHILE. Especially with a standard lift and RTT. The best way is in from flagstaff which is how we will be dropping in. Fastest way there is go into flag on the I17. Turn left on university (just past the light before the Wendy’s) right at the next light, then left on Route 66. Follow that a mile of two and turn left onto woody mountain. Will turn to dirt pretty quick. I’m going to try to link some probable coordinates soon. We won’t be leaving expo till later afternoon. By the way I’m working back up in Cave Creek as of today so you may be seeing more of me. Well, like Ratfink said, best laid plans. I have some heavy work going on this weekend but would love to sneak out and at least meet some folks in person if you guys can let me know where you decided to setup camp (or shoot a phone # to text via PM or however). Otherwise, if some are planning Woody Mtn Road that would probably mean hitting the 532 from there to Purple Sage and in the race track way to the Expo so I can cruise around there and hope to bump into you cats out that way. I'm planning on going up early Friday morning for the Expo as well. Unfortunately, I won't be able to stay and camp. Need to come back to the valley for work Sat and Sunday. BucketBoy, where are you planning on meeting/leaving from Friday morning? I am planning on heading up about the same time you are. 2008 Sandstorm FJ: ARB Front Bumper, Sliders, Man-A-Fre UCAs, OME Lift (heavy front and rear), 40" Aurora Dbl Row LED Light Bar upfront, Aurora LED Cubes (flood) in the rear. The Great Jimbolio & ModMuscle are camped out already in the 2010,11,12 Sedonafest field on Schnebly hill rd, near Mason tank. What a peaceful place when there aren't 70 FJ's in here. Took some AWESOME milky way photos last night. When we get them back from Walgreens, we'll scan them and post them. Here it is, the Overland Expo Explorers. 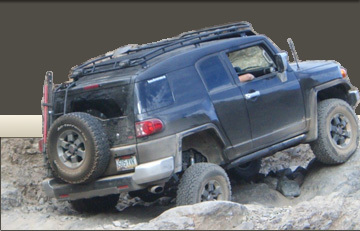 I will be leading a Friday Morning group caravan to Overland Expo. Meetup address is listed above but it's the Chevron/4 sons off the I-17 and the Carefree Highway. Roll out sharp at 6:45am (please be gassed up and ready to go, not just pulling in).